Known for begging women to reno their pearls stuck in a drawer, I'm taking my own medicine. Above, the original clasp on a strand of fancy-coloured Tahitians (bought several years ago from Kojima Company); it was pretty but fiddly, a channeled box clasp (hidden by dome-set half pearl) that took multiple tries to attach. I decided to change the clasp the next time I needed restringing. 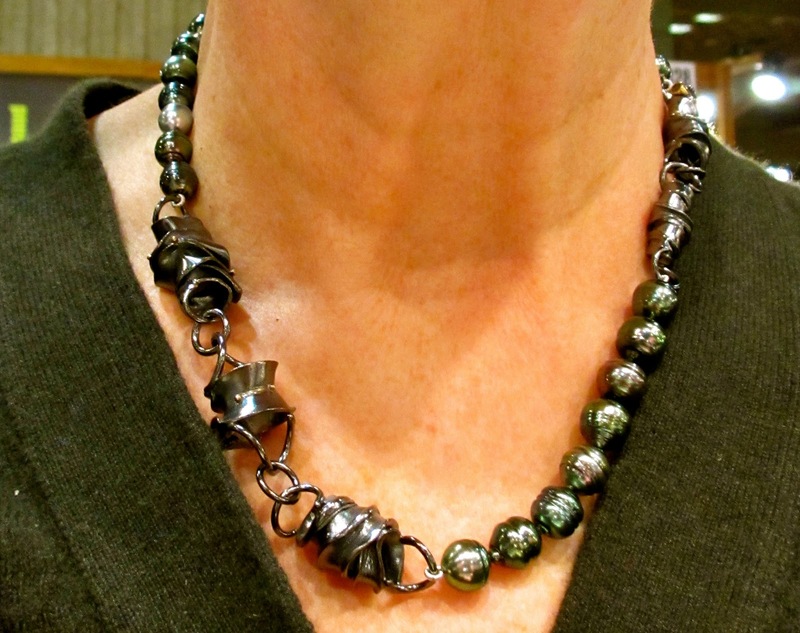 Like buttons on a coat, a new clasp can change the entire character of a necklace, and is especially good for making a plain or too-formal necklace a hipper, looser piece. I wanted something other than a stock clasp, in the funky/organic mode. I filed this project in my mind until I found the right designer. 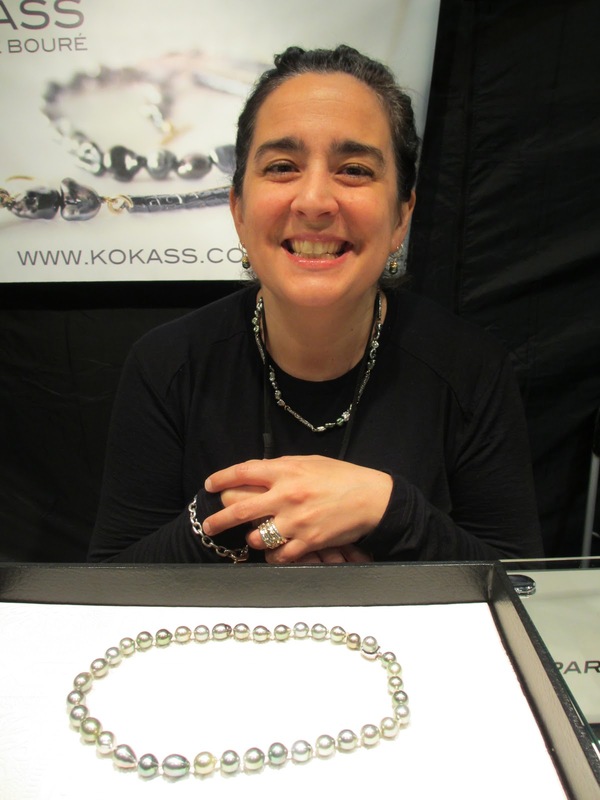 A year ago, I met Québec jeweler Céline Bouré of Kokass, with whom I share a mission: to nudge the gem from proper to divinely wearable. I loved her work. Le Duc gave me my first Kokass piece, this pearl pendant, a metallic Chinese freshwater that glows wildly even in the dimmest light, set on a chain punctuated with silver handmade beads inlaid with 22k gold. To never remove it would involve a $2,400 investment, and besides, why not work with your bought-and-paid-fors? But madonna, this was a bliss-inducing bauble! Céline won the prestigious Perles de Tahiti prize, as well as an award from Van Cleef and Arpels, yet her work can be worn with the simplest clothes. The designs are loose, light and joyful, and she has an eye for interesting pearls, mixing South Seas, Tahitians and freshwaters. I visited her at the Salon des metiers, a large craft show at which she had a booth. (She is based in Québec City.) She also can consult via Skype. We decided that the clasp would be worn at the side. My strand is slightly graduated, so I had to make that decision; if they matched in size it, wouldn't matter where the clasp was set. After Christmas, Céline took her time thinking. She often awakes at night full of ideas and heads to her bench. This moment, when I place my trust in the artist's talent, is my favourite, and also the scariest. I try to approach someone whose work I admire with respect and not many directives. A budget, yes– but not a long list of specifications or tight deadlines. The cost, $145, includes restringing and taxes. I've hoped to show how a new clasp can transform your necklace. That works best if you like the pearl size. If not, mix in some bigger or varying sizes, different pearl varieties, or other material. Once you find a jeweler (perhaps the gifted Ms. Bouré herself), the pearl world's your oyster! Duchesse, it's fabulous! I love that clasp. And your Tahitians are stunning. It's fabulous!! The update makes your pearls look even more glowing, like your smile!! The clasp on the side is a wonderful modern addition. Very clever designer. Unusual and unique what better way to update your pearls! I do admire that necklace that your husband gave you! 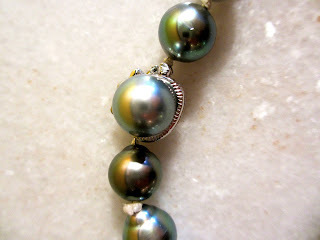 Your pearls are gorgeous and this new clasp adds a wonderful element. Thank you for walking us through this process and once again sharing your great knowledge about jewellery. I'm learning so much from your posts. I love it! My pearls are nice ones, but small and white (you know the type). They would require added material to make them fun and appropriate for me at age 60. Can you picture them? And--what, off the top of your head would you think to do? I can almost picture some ideas based on your jeweler's talent. Pseu; So here is another source for your possible reno of MILs strand. Well Styled; Those *are* lively pearls. I have nothing but praise for Kojima Company; Sarah Canizzaro is marvelous to work with. LauraH: I love to reno pearls! Susan: Can picture them but what is the mm size? Feel free to e-mail me a photo and I can offer ideas re style and/or varieties. Duchesse, I think a lot of us may have a string of white pearls like Susan's that are due for an update. Reno ideas might make a nice post! Duchesse, I will send you a photo of my pearls. But first, where is your email address at your site. I've looked for it, but must be missing it. 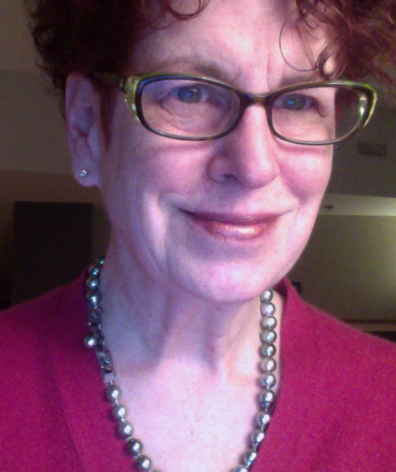 Also, I'm clueless as to mm size of my pearls, but they are small. Perhaps if I photograph them next to a common object, you will have an idea of their size. Susan: Scroll way down to near bottom of far right column, where it says "Welcome to Passage des perles" and you'll see the addy under my name. Use a mm tape to measure the diameter... most older necklaces are around 5-6mm. Smaller pearls than that are usually girls'. As with your narrative of having your fur restyled, this is a wonderful story of a successful collaboration -- so cool to see the process from the beginning and what a gorgeous, gorgeous result! Goddamn! Glorious, woman! Thing of beauty, piece of art! Brilliant. Beautiful! never even thought of that and I make jewelry, go figure. You look great in them, too! Wonderful rehab project, and the result is beautiful and uniquely yours. A fine description of a fascinating process - one I had never even considered. And your reference to being aware of the size of your pearls reminded me of my night-cream's direction to "smooth a pearl sized amount" on my face - I have yet to figure that one out. Your pearls are gorgeous and you have so much style. Belatedly, I wanted to tell you about a book I enjoyed recently even more than "Gone Girl" (which I also enjoyed very much). The book is "Sweet Tooth," by Ian McEwan. It is so good! gretchen: Now you have yet another idea! Lane: I like restyling best of all projects. Stay tuned for ideas concerning a photo of a strand a reader sent me. Marsha: Pea-sized dab on tip of pinky? Francie: Anything by McEwan will always be on the top of my list, thanks!